One of the most important 20th century German women writers, Christa Wolf, died in Berlin on 1st December, aged 82. Until 1989, she was among the few German authors who were highly regarded by readers in both German states: her native East Germany as well as in West Germany. Wolf’s work is a constant grappling with her times. This began with her 1963 breakthrough novel Divided Heaven (Der Geteilte Himmel) which reflected the time the Berlin Wall was built, where the heroine chooses East over West as the place where people undertake to build a new kind of (socialist) society. In Wolf’s next novel, The Quest for Christa T (Nachdenken über Christa T. 1968) she develops her distinctive voice. Her new theme is the complex relationship between the sensitivities of an individual and societal expectation. In her epic account Patterns of Childhood (Kindheitsmuster, 1976), Wolf traces the presence of Nazi thinking in the lower middle classes of her native Silesia, examining with great honesty her own childhood experiences and tracing her family’s history up to their flight from Poland to Germany. Once again her voice is innovative, alternating between I (present) and you (past) for the same character. This allows her to create a kind of narrative fabric where strands interweave, creating a non-linear pattern, which – she feels – is closer to the way we think and allows the expression of the untellable. It is a voice Wolf employs again in her final published work, City of Angels (Stadt der Engel, 2010). As Wolf’s disillusionment with contemporary socialist society grew, she explored the position of outsiders, projecting this theme into the post revolutionary, Romantic era and into antiquity, in such works as No Place on Earth (Kein Ort. Nirgends.1979) and Cassandra (Kassandra, 1983). Cassandra was written at the time when nuclear missiles were being stationed on both sides of the so-called “iron curtain”. It is told from the point of view of that female mythological figure, to whom ‘seeing’ meant looking at something deeply and seeing it for what it is, yet having no voice. In this way, Cassandra has much to say to us today – she finds the word “pre-war” for the state of a society living in denial of the dangers of war, and not listening to warning voices. The book is also an exploration of female identity, as is the story Self-Experiment (Selbstversuch, 1973). A recurrent theme in Wolf’s work is the alienation characters feel from mainstream society, whilst holding on to ideals that connect them with a utopia. The feeling of not being grounded in socialist society but in its ideals is one that Christa Wolf shared with other East German intellectuals and artists. However she publically intervened in society when she felt the need arose. Perhaps the most famous occasion was in 1976, when she, along with a significant number of influential artists, protested against the expatriation of singer and songwriter Wolf Biermann following his criticism of the GDR (East Germany) at a concert in Cologne. Later, in 1989, Christa Wolf spoke at a mass rally in Berlin Alexanderplatz in an appeal to democratise the state. Wolf was deemed a dissident writer by the West and was seen as an opponent to the system by her own government. However, as soon as the wall fell, she, like many other East German writers, was condemned by the West for not having been critical enough, and of being a loyal State poet. In 1993, Wolf was hounded by the press for having cooperated with the Stasi briefly more than 30 years previously, at a peak of the cold war. In an effort to clear her name and in an unprecedented move, Wolf published her file, which showed that she had not incriminated anybody in any way to the Stasi. The press took no notice of Wolf’s publication. As Sigrid Löffler, well-known Austrian literary critic commented: “She was devalued as representative of the whole of GDR literature, she was taken off the literary canon and was turned into a scapegoat to justify the liquidation of GDR art.” Wolf reflects on the collapse of the socialist system, and the West’s condemnation of lives lived in her homeland, in City of Angels (Stadt der Engel), using the context of her literary scholarship stay at the Getty Center in Los Angeles in 1992/93. In her book Medea (1993), she reflects on, among other things, how history is always written in the interest of the victor: it becomes his story. 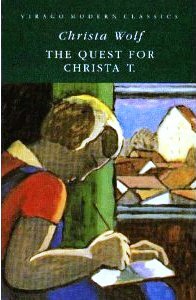 Christa Wolf was a tremendously influential author, in East Germany in particular. Her books have been translated into many languages, including English. They have much to say to concerned and thinking people around the world. Her uncompromising honesty and supreme literary quality were unique.